I bought my daughter one of those little quadrocopters from eBay. It was a lot of fun but the battery seems to have died. I found a replacement on eBay for a couple of dollars, which arrived today. Unfortunately it was slightly larger than the original. I thought this wouldn’t be a problem so I just cut some bits out of the chassis of the quadrocopter and jammed it in. 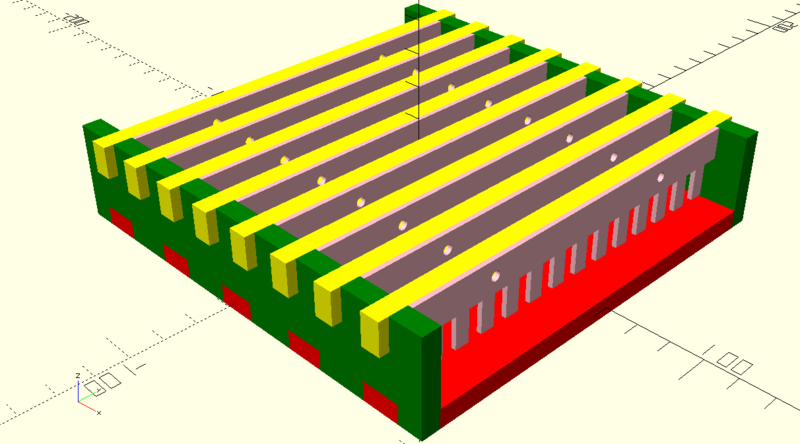 Designing and lasercutting custom electrophoresis gel trays and combs. I’ve been approached by my squid scientist friend, Heather, to make a custom tray and combs for casting agarose electrophoresis gels so that she can run 96 PCR products at a time. Gel combs are pieces of plastic which are plunged into the liquid agarose before it sets to form wells in the solid slab that you can load with the product of your PCR run. This is the kind of lab gear which costs fantastic sums to purchase from vendors, particularly with any sort of bespoke customisation. Have a look at Thermo Scientific or Sigma Aldrich’s web site, where you will find these little pieces of plastic on sale for around NZ$100 each. This type of thing is a very straightforward object to design and make for anyone with a few CAD skills and access to a lasercutter. I knocked up a design in about 5 minutes to demonstrate this to Heather and she got very excited and set off to measure up exactly what she wanted. I have some clear 6mm thick acrylic sheet which I can use for the gel-casting tray and I’m going to order some 1.5mm acrylic sheet from RS to cut the combs from. In exchange for my help I get to post the design here on my blog so win-win! I’ve sketched out the design and its looking great. I’m going to do a test cut in MDF first to see how it fits together. Last month our new Agilent GC-MS was installed! Shortly after it was commissioned I had to watch nervously as the Gerstel engineer cut bits out of it so that he could enhance it further with a new Dynamic Headspace Sampling [DHS] system, including Thermal Desorption Unit [TDU] and Cooled Injection System [CIS]. This was dramatic but very rewarding as we now have the first and only DHS system in New Zealand. DHS is a very sophisticated way of getting all of the volatile compounds out of a solid or liquid sample and into a GC-MS. It uses the same principle as static headspace analysis but, instead of just injecting a volume of the headspace or using an SPME fibre to trap the volatile components, DHS uses a flow of gas (your choice of helium, nitrogen or air) through the vial’s headspace to continuously remove volatiles from the headspace and collect them on a sorbent trap. The sorbent trap is then transferred to the TDU and the volatiles desorbed onto the CIS for analysis. The whole process is automated and highly customisable. Because volatiles are constantly removed from the headspace you can capture the entire volatile component from a given sample, making the technique much more sensitive than SPME and a massive step beyond static headspace analysis. The applications for this technology are primarily in the field of food science, where flavour and fragrance volatiles are common characterisation targets. Gerstel have some more elaborate suggestions for applications, which interest me more, such as the characterisation of volatiles emitted by brown marmorated stink bugs. This application note describes how you can put a live animal into the DHS vial to analyse its volatile profile in vivo! The procedure seems entirely harmless to the subjects (beyond the mild irritation they might experience from being confined within a glass vial), providing volatiles are extracted at ambient temperatures using air. Another very useful new technique which is available to anyone with a TDU is Thermal Extraction [TE]. This can be applied to solid or liquid samples placed inside the glass TDU tubes. In practice you can use TE to analyse almost anything, providing you can get it into the tiny glass tubes. So far I have analysed lyophilised lamb meat and abalone tissue, a tissue snip from a snapper ovary, honey and even a piece of a leaf. My new PhD student is now applying the technique to the desorption of PAHs from particulate filters to characterise the prevalence of these notorious carcinogens in the air around New Zealand and in his native Rwanda. My summer student, Kalita, has been digesting oligosaccharides, derivatising them and injecting them into the mass spectrometers in an effort to derive structural information from these complex molecules. We had hoped to use acrylamide gel electrophoresis to visualise the performance of our digests, in the way of Pomin et al (2005). This figure from the paper shows the effect of their hydrolysis technique upon the molecular weight of the oligomer. Note the banding patterns resulting from selective hydrolysis of certain glycosidic bonds. This produces a regular reduction in size of the fragments. We wanted to use this feature to produce polymeric fragments in the <10kDa size rage. These would be amenable to LC-MS/MS, as in Lang et al (2014), allowing us to infer the sequence, functionalisation and bonding of the monomers within the oligomer. As it turned out our acrylamide gels got lost somewhere amidst The Great Bureaucracy and so, with time running out we cast around for alternate technologies. Enter Yang, et al (2009), who used a similar technique in their paper, but also deployed Size Exclusion Chromatography to illustrate the size-class of fragments produced. Fortunately or chemical store had a shelf of old bottles of dextran and other GPC or ion-exchange substrates. We dug up a protocol from an MSc thesis by Wilfred Mak in which he’d used an anion exchange substrate to determine the molecular weight of intact sulfated fucan oligosaccharides, rifled through the stores to find some substrates that looked about right and away we went! At the bottom, hidden by the blue compression screw, is a plug of deactivated glass wool with a few mL of sand on top of that and then the white dextran gel. This was the first addition of substrate and settling. After topping it up we have a column of about 40cm length. This type of column is purely gravity-fed. You add sample and running buffer at the top and wait for the head of fluid to pass through the column, collecting fractions through the tap at the bottom. This can take hours. While Kalita was putting this together I was looking at some of the old silica particle LC columns I had and wondering if I might dismantle them, remove the packing and repack them with the dextran to give a real, high-pressure column. This could be plumbed into one of our conventional LC setups, allowing us to push samples through at a faster rate and giving the option of automated sample injection, data and fraction collection. I had something of a brain wave and realised that I had some Swagelok fittings which would allow me to fit a piece of 1/4″ polypropylene air line with pressure-tight caps and LC fittings at either end to fulfil exactly that function. A couple of hours later Kalita and I were the proud parents of monstrous creation on the left! The white tube held between the two clamps on the left hand retort is the air line packed with hydrated dextran. The line at the top comes from the Shimadzu LC pump on the right, which is pumping Tris buffer through the column to settle the packing material. We can get a flow of 2 mL/min through the column with a back pressure of about 5 bar. Plenty for LC! For now our creation is parked until we can get round to doing something cool with it on Monday but watch this space to see the outcome. Our intention is to add an autosampler to the front for sample injection, a Refractive Index Detector and maybe even an electrochemical detector on the outflow to detect what came off the column and possibly even a fraction collector for downstream LC-MS/MS analysis of the fractions! Fun! Our first goal is to validate the SEC function by injecting a range of proteins stained with Bradford Reagent. We can also try some di- and tri-saccharides along with our oligo digests. 11-03-2016: This project hit a problem. See update at the bottom. Following on from my bathroom scales hack I spent this evening sawing and screwing together the platform for it to sit on. This was an urgent task as the bee hive is being moved to a new location tomorrow and so this would be an ideal opportunity to get the scales in place without having to arrange another movement of the hive. Bees are incredibly precise creatures, I am discovering. If you move their hive a just a few meters away when foragers are out, they will return to the location they are familiar with and won’t be able to find their way home! If beekeepers have to move their hives such a short distance they’ll move them a couple of kilometers away for a week and then move them to the new spot. The scales will sit on a plywood deck raised off the roof’s surface to provide a thermal insulation gap for the hive. I drew up the rough schematic below to illustrate this. This next one is upside down but illustrates how the four strips of ply keep the top shelf secure. You can also see the curtains. The notches at the back are for wires to exit. Looking forward to testing this! Unfortunately there is a major flaw with my design. When Matt went to put the bee hive on top of it it turned out to be unstable due to the small footprint of the scales relative to the hive. The hive is only one box at the moment but Matt intends to add another soon and that would definitely make it vulnerable to being blown over by a gust of wind! Not a desirable situation. I am going to have to look at designing a larger platform to the corners of which I can attach the load cells. This is contrary to the advice on the MakeZine blog that inspired this project, however I cannot see any other solution besides buying an industrial-size set of scales. I want to try the DIY option first before I spend a couple of hundred dollars. Hopefully this will be the start of a series of posts on the Internet of Bees, or the #IOBee. In case you didn’t realise, this is a play on the Internet of Things, or IoT. My intent with the IOBee is to document my application of some basic sensor technology to monitoring the health of bee hives. There is an excellent writeup here of a conversion of a set of luggage scales to a real-time bee hive mass monitor. I have been wondering if I can do the same thing to monitor the mass of experimental bee hives in some research I’m planning looking at the effects of neonicotinoids upon honey bee colonies. In order to test this out I ventured onto eBay and bought a couple of HX711 breakouts, which you can get for just a couple of dollars. I also bought a cheap set of bathroom scales from the Warehouse, despite the advice on MakeZine, which advised not to skimp. I intended this to be a proof-of-concept so I wasn’t going to be spending big bucks just yet. This turned out to be an excellent hacking subject. After taking the back off I found a circuit board carrying the integrated circuit, some components and some wires. The two black pads you can see are the rubber feet on the bottom of the load cells. I prised one out to show you the other side. The red white and blue wires coming from each of the four load cells needed to be joined together carefully according to the first image in this excellent post on StackExchange that I located after a modest amount of googling. I also found this how-to from SparkFun to be informative. Having wired everything together I needed an electronic brain for my creation to talk to so I hooked it up to the Arduino Nano I’ve been using as a receiver for my solar-powered, wireless monitoring testbed. Ignore the BME280 and the NRF24 coming off it. VCC went to 5V, GND to GND, SCK to D4 and SDA to D5. Five minutes of soldering later I was back reading numbers and this time they went up with the mass on the scales. According to the instructions on the test sketch I kept adjusting the calibration factor until the scales read the correct mass for the object I’d put on it. Then came the acid test: now it was calibrated, would it get my mass right? As you can see it worked almost perfectly. And I am somewhat overweight. This gave me three decimal places instead of one and significantly more information. I was particularly pleased to see that these scales read quite consistently. The numbers for my weight jump about quite a lot because I wasn’t too worried about keeping still to get a stable reading but when I placed a fixed mass on the scales the second decimal place was pretty stable and only the third flicked up and down by 1-3 units. These scales were advertised as being accurate to +/- 100g so my results indicate I can do much better than that. And that’s without any of the tricks you can use with microprocessors to improve the accuracy of otherwise low resolution tools, such as polling them and taking a moving average. More on the application of this very cool hack another day, once I’ve validated the calibration as described on MakeZine.